Rajasthan Royals continued their dream run by defeating the defending IPL champions KKR. Royals team pick started with a big surprise as they picked 5 fast bowlers without even a single spinner. Royals started off in their own slow fashion as always and when the time came to accelerate, wickets fell off, but somehow, Hodge & Yagnik provided the much needed late impetus to propel Rajasthan to 144 runs. Kolkata started off well in first over but after then, bowlers called their shots and kept KKR always under control and never allowed KKR to set themselves up for an assault. Eoin Morgan was the only bright phase KKR innings had, but he ran out of partners to help him out. – Shaun Tait bowled the fastest ball of this season when he clocked 150.1 KMPH, which bettered 149.2 KMPH by Mitchell Johnson. – Yusuf Pathan averages 19.27 in his last 18 IPL innings with a strike rate of 113. His best score in this period is 40*. – When Manoj Tiwary scored his 8th run, he went past 1000 runs in IPL Career. – Kallis is out for duck for the third time against Royals highest by him against any team in IPL. – Sreesanth has conceded more than 14 runs in his first over in 23 occasions including the one today. – 18 runs conceded by Sunil Narine is the highest runs conceded by him in any domestic T20 tournament. – Victory by Rajasthan royals today is the first of its kind, Because Royals have never won a game if they have scored less than 145 runs before, and In fact they last 14 games before this. – 115 boundaries scored by Rahul Dravid is the second highest for Rajasthan Royals, top scorer is Shane Watson with 122 boundaries. – 7 times both Rahane & Dravid has involved in a 50+ partnership. 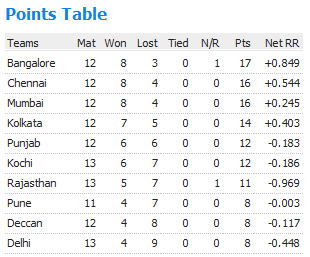 – 125 runs scored by KKR is the lowest score against Royals. Match 60, KXIP need 3 out of 3 to be in the play offs, Gilly the captain who has done it for Deccan’s two years ago to win 4 out of 4 and make it semi’s and eventually going on to win the cup in the second season. Hopes won the toss and decided to field first, Again a failed batting performance for Gilchrist, but Paul Valthaty and Shaun Marsh made amends, as they went on to put 102 run partnership. Once both departed of consecutive deliveries run rate slowed down and KXIP ended their innings with 170/6 in 20 overs. Delhi showed no intent in winning the game, that to after losing the first 3 wicket, they were buried dead alive. DD finished at 141/8 in 20 overs, giving KXIP a much needed win with 29 runs slack. All now Gilly and Preity will be hoping for is just 2 wins. We can say, if Gilly can pull next one against RCB’s then, they are well and truly home as they will face Deccan’s in the final encounter. Match 61, Warne’s Royals needed this win badly to stay in the competition, A very important game for Rajasthan, but to me its the worst game they ever played for this season, Poor shot right from the beginning led no where other than to bundle out less 100, with paltry 97 in 18.3 overs. Where a score of 180 is par one just because of shorter boundaries on both ends. Kochi Tuskers did no wrong as McCullum and Hodge no time in wasting scored the 98 runs in just 7.2 overs with the loss of 2 wickets. KTK decimated Royals and they chucked them out of competition of this season. Hopefully Royals sans Warne should do well. 1. Royal Challengers Bangalore 2. Chennai Super Kings, 3. Mumbai Indians, and 4.Kolkata Knight Riders. 1. Delhi Daredevils, 2, Pune Warriors, 3. Rajasthan Royals and 4. Deccan Chargers. – Victory for KTK with 76 balls to spare is the highest ever for the season, and second highest for IPL. List was topped by Mumbai’s victory over Kolkata with 87 balls to spare in first season of IPL. Ironically both the times wicket victory margin was 8 wickets. To add up in the twenty20 internationals, this is 4th highest in terms of balls remaining. – Praveen Kumar bowled the 25th Maiden of this tournament, and he is also the only bowler to bowl 6 Maidens in the IPL tournament. He has bowled 4 in this season. – Paul Valthaty became the second batsmen to score 50+ boundaries in IPL this season, he went past Shewag’s 51. – Paul Valthaty also went past Chris Gayle to pick up the Orange cap from him; he was the sixth batsmen to go past 400 run mark this season. – Brad Hodge became the 11th bowler to pick 4 or more wickets for this season. – Paul Valthaty scored his 2nd Fifty of this season. – Brad Hodge scored the 1600th Boundary and Brendon McCullum scored the 500th Six of IPL 4. – 102 runs partnership between Paul Valthaty and Shaun Marsh is their highest 2nd wicket partnership for this season. Match 45, Giant KKR Vs Giant Killers KTK, Gambhir won the toss and what else he want to field, as he expected his bowlers delivered very fast by removing McCullum and Parthiv Patel. Jayawardene held the innings and went past his fifty in gritty times, late surge from Brad Hodge made sure KTK went past 156/5 in 20 overs. KKR went on to get the best start of the tournament, with Kallis and Morgan setting the perfect platform, But a double strike from Gomez got KTK back into game and from then, KTK kept the necessary checks to pull KKR just before the ropes, Even a Valiant 66 from Morgan couldn’t help the cause as they fell short of 17 runs. Match 46, A dumbstruck match that’s what any1 who witnessed will describe it, One man can’t win a 11 men game, no i am wrong, Just one man can win it all… Yes, It’s possible if u call yourself Virender Shewag… A Superlative pronoun Century from the Delhi skipper, told the tale for Deccan’s as they have won only one of their home games in this season, and it will be to. Sangakarra, Duminy, Christian all powered Deccan’s past 175/5 in 20 overs, Delhi started off with the worst ever fashion, but One man did it all, so rest can feel so safe around him. A Astounding 119 got Delhi home with 4 wickets and 6 balls to spare. With this Delhi pickup an important win, to keep them in competition. – 69 runs between Kallis and Morgan is the best opening partnership for KKR for this season. – Kallis went past 300 runs for this season and he is fifth one to do so. – R.Gomez bowled the 4th Double wicket Maiden of this season, Praveen Kumar, Dougie Bollinger and Sreesanth were the others. – Bret Lee bowled the 18th Maiden and Gomez bowled the 19th of this season. – Gambhir picked up his first duck of this season and that too a golden one. – Eoin Morgan scored his first IPL fifty. – 1200th boundary was scored by Virender Shewag. – Shewag scored his first IPL century in IPL and 3rd by a Delhi Player, his previous best was 94*Vs Deccan Chargers. 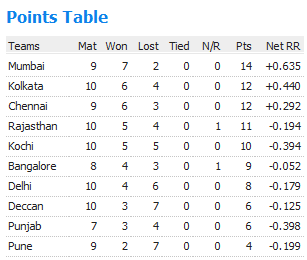 – Shewag’s Century is the 4th one of this season and 16th overall in IPL so far. – Shewag’s is the first man to go past 400 runs mark in IPL 4. – Shewag also went past his 1500 IPL runs for Delhi Daredevils, he is now with 1516. – 119 by Shewag is also the highest ever by any Delhi Player, previous were 107* by Warner and 105* by AB de Villers.